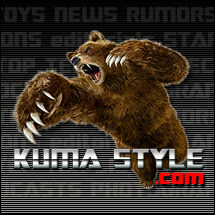 Toy Nippon: BBTS Sponsor News: Portal 2, Transformers, DBZ, Lone Ranger, GI Joe, Star Wars, Hot Toys, Sonic, TF2 & More! BBTS Sponsor News: Portal 2, Transformers, DBZ, Lone Ranger, GI Joe, Star Wars, Hot Toys, Sonic, TF2 & More! Six new items have been added to the Mattel sale list. We now have two DC Universe Two-Packs - Starfire & Adam Strange and Alexander Luthor & Ultraman - at $13.99 each. Retro Action DC Super Heroes Green Lanterns Guy Gardner and John Stewart are priced at $13.99 as well. Finally, the recent SDCC 2012 Death 8" figure and the Blazing Sword Voltron figure are each priced at $15.99. The latest from the S.H. Figuarts line is Goku's friend Krillin from Dragon Ball Z. He comes with his Destructo Disk attack and is priced at $39.99. This figure from "GI Joe: Retaliation" comes with a Dwayne "The Rock" Johnson head sculpt, brass knuckles, multiple other weapons, alternate hands and more. It has over 30 points of articulation and is listed at $219.99. STAR WARS REAL ACTION HEROES (RAH) TIE FIGHTER PILOT - BLACK 3 "BACKSTABBER"
This new piece from UD Replicas is designed after Boba Fett's Mandalorian armor and contains a removable inner lining. It includes form molded armor sections in the chest, shoulders and back and is made from Grade A cowhide. We have it in sizes from XXS to XXL (with sizing information on the page), and it is listed at $714.99. A new line of decals especially made for your car is on the way. The first decals measure 13.75" x 19.75" and have characters and ships such as Darth Vader, R2-D2, the Millennium Falcon, Slave I and more, and are priced at $29.99. They are removable and allow air bubbles to escape through their semiporous membrane, and are also made to protect the car's paintjob, so you can show your fandom without risk to your vehicle. Larger sizes are soon to be released as well. These add-on weapons are now being released in pink as well, so that version of the motorcycle-robot doesn't need to go without. The set is listed at $21.99, $5 off the MSRP. NECA's second version of Rambo shows him as he hid from the police. It includes an assault rifle, pistol, walkie talkie and spear, and is listed at $17.99, saving you $3 off of the MSRP. This fluffy prop-size version of Gizmo stands 9" tall, has moveable eyeballs and other articulation, and also comes with a pair of 3D glasses like he wore in the film as well as three 'furballs' for when he gets 'wet'. It is listed at $294.99. ThreeA's Dark Blind Cowboy comes with his Dead Horse mount in this set. It also includes 7 pistols with holsters and is listed at $274.99, $15 off the MSRP. Hollywood Collectibles is producing a new life-size bust of Nemesis from the Resident Evil series. It stands 28" tall, is made of fiberglass and mixed media and hand painted. It is listed at $799.99. This new statue is of a cartoonized version of Vampirella. She stands 10.5" tall with her friend Butchie the Bat on her arm, and is listed at $159.99. Kotobukiya's newest Zoids HMM kit is the EZ-017 Iguan. This upright lizard-mech is priced at $64.99. Acme Archives has announced a number of upcoming Star Wars releases, including Limited Edition TechPlates for the Landspeeder, the X-Wing and the Millennium Falcon at $264.99 each, saving you $30 each off the MSRPs. We also have pre-orders up for many new limited edition Giclees such as Artoo's Lonely Mission at $148.99, Little Luke's Destiny at $79.99 and Fett at $112.99. This first assortment includes Duke, Snake Eyes, Storm Shadow, Shipwreck, Cobra Commander and a Cobra Trooper. They come as a Set of 6 at $31.99, or singly at $3.99 - $11.99 each (although Shipwreck is currently sold out as a single). We are currently between shipments of the popular Series 03, but in the meanwhile we are fully stocked on singles of previous waves; if you missed out on Twinstrike, Airachnid, Prowl, Smokescreen, Soundwave or Bumblebee, we have them in stock now, priced at $5.99 - $8.99 each. We also have stock of a number of previous waves' sets and cases, so check them out. We now have the robots that make up Hercules' brother Perseus available as two-packs. You can get Dr. Crank & Exgraver, Heavylabor & Neckbreaker or Madblender & Structor available at $189.99 per two-pack; if you complete the trio of two-packs, just let our Customer Service department know and you will get the Perseus Box, poster and cards added to your order, free of charge! This clear purple version of Keith's Fantasy Club's latest transforming cassette release is now in stock. It is priced at $21.99, $2 off the MSRP. This figure comes dressed as he appeared in "X-Men: The Last Stand" and includes a Sentinel head display base, alternate hands, a leather-like outfit and more. It is priced at $234.99. This furnace comes straight out of the movies and features a hinged door with LED 'flames' behind it. It stands over 9" tall and is listed at $39.99, saving you $5 off of the MSRP. Three of DC's Iconic 1/6 scale statues from the upcoming film have arrived. We have Jor-El, Zod and Faora in stock, priced at $109.99 each (saving you $20 each off of the MSRP). This 12" tall figure is in scale with NECA's other 1/4 scale releases and includes his sword Sting as well as a sheath. The figure is listed at $47.99, $7 off the MSRP. This statue of the paladin-turned-dark-knight stand 19" tall, 19.5" wide and 20" deep, and shows him in full skull-detailed armor striding across a frozen base. The statue is listed at $339.99, $10 off the MSRP. This die-cast figure of Donald Duck comes with an alternate head and alternate hands. He stands 5.5" tall with 20 points of articulation and is listed at $89.99. This knife was created for the movie and features a 9.5" 7CR17 stainless steel blade. It comes with a classic leather belt sheath and a Certificate of Authenticity, and is listed at $106.99, saving you $36 off of the MSRP.